A coalition of over thirty civil liberties groups have joined forced forces to lobby the Department of Justice to scrutinize the FBI’s controversial new biometric database. The groups, including the ACLU and the Electronic Frontier Foundation, sent an open letter on Tuesday to Attorney General Eric Holder, arguing that the system has not been properly vetted, and will facilitate the collection and storage of a hugely broad sweep of images of law abiding Americans who have done nothing wrong. The Justice Department long ago promised to complete an audit of the biometric system, which will be made up of iris scans and palm prints, along with images linked in to facial recognition systems. So far neither the the FBI nor the DOJ has done anything toward fulfilling the promise. The liberty groups warn that the FBI program “has undergone a radical transformation” since it was last reviewed some six years ago. A complete absence of oversight “raises serious privacy and civil-liberty concerns,” the groups contend. The database, which already holds millions of fingerprint and photographic records, is scheduled to go live before the end of the year, but has never even been subjected to a routine Privacy Impact Assessment. The FBI plans to have up to a third of all Americans on the database by next year. There are currently no federal laws limiting the use of facial-recognition technology, either by private companies or by the government. The Electronic Frontier Foundation noted in an April communique that some 52 million Americans could be on the Next Generation Identification (NGI) biometric database by 2015, regardless of whether they have ever committed a crime or been arrested. Profiles on the system will contain other personal details such as name, address, age and race. The group managed to obtain information pertaining to the program via a freedom of information request. The system will be capable of searching through millions of facial records obtained not only via mugshots, but also via so called “civil images”, the origin of which is vague at best. A map within the EFF’s piece shows which states are already complying with the program, and which ones are close to agreeing deals to do so. The EFF notes that currently, the FBI has access to fingerprint records of non-criminals who have submitted them for any kind of background check, by an employer or government agency. Going forward, however, all records, both criminal and non-criminal will be stored on the same database. “This means that even if you have never been arrested for a crime, if your employer requires you to submit a photo as part of your background check, your face image could be searched – and you could be implicated as a criminal suspect, just by virtue of having that image in the non-criminal file,” notes the EFF. “[T]he FBI only ensures that “the candidate will be returned in the top 50 candidates” 85 percent of the time “when the true candidate exists in the gallery.”” EFF states. “It is unclear what happens when the “true candidate” does not exist in the gallery—does NGI still return possible matches?” the feature asks, noting that those identified could potentially be subjected to criminal investigation purely because a computer has decided that their face is similar to a suspect’s. “This is not how our system of justice was designed and should not be a system that Americans tacitly consent to move towards,” the EFF piece concludes. 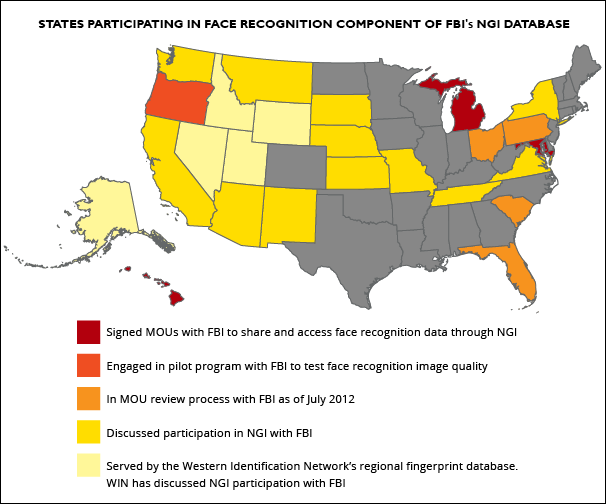 A previous government report, dating from 2010, was made public last year via FOIA, revealing that the FBI’s facial-recognition technology could fail up to 20 percent of the time. The coalition of privacy groups notes that even that is a conservative estimate, owing to the fact that a search on the database will be dubbed a success if the eventual correct suspect is flagged up within the top 50 possibilities. This means that 49 other innocent people who have never done anything wrong could be potentially marked as suspects without being considered false matches. The Justice Department says it is reviewing the letter from the privacy groups. It is somewhat remarkable that when Google announced the release of its Glass product, it was forced to ban applications with the capability for facial recognition due to a huge privacy backlash. The Federal government, however, continues to use such technology unhindered to create biometric profiles on anyone and everyone. The Department of Homeland Security also has its own facial recognition program, which it routinely outsources to police departments. Meanwhile, new innovations in facial recognition technology continue to be billed as potential tools for law enforcement, including the prediction of future crime. The NSA, it has been revealed via the leaked Snowden documents, intercepts approximately 55,000 “facial-recognition quality images” every day.